This coffee cup sleeve is quick and easy to crochet, perfect for beginners. It is made with one of my favorite patterns to create ribbing, single crocheting in the back loops only. The technique creates a stretchy fabric that is easy to slip on coffee cups of different sizes. Included within the pattern are instructions to adjust the size if you need the sleeve to be wider, narrower, longer, or shorter. Crochet a bunch in different colors for yourself or give them away as gifts! Get creative and personalize the sleeve with appliques. Will fit most standard coffee cups and will stretch to fit different sizes. Instructions for adjusting the size of the sleeve is included within the pattern if needed. 8 rows in pattern measures 2 1/2″ wide and 2″ long. Start by chaining 11 or a chain that is the desired height of the sleeve. Repeat row 2, 30 more times or until sleeve wraps around the cup snugly. Slip stitch short ends of sleeve together. Finish off. 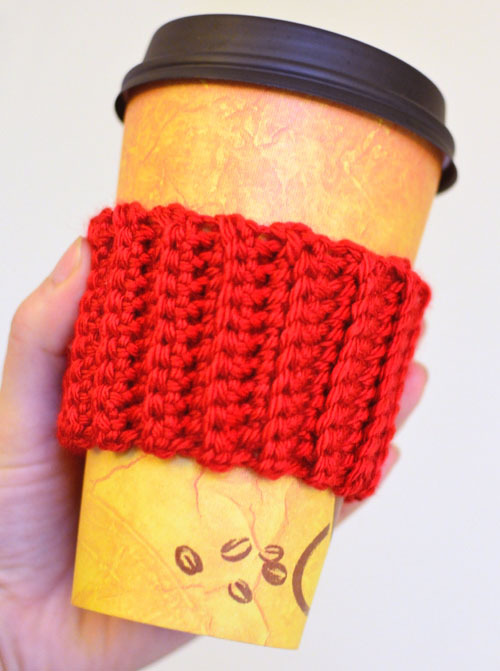 Need help while crocheting your coffee cup sleeve? Leave your questions below! This entry was posted on Wednesday, December 6th, 2017 at 12:00 AM by Rachel Choi	and is filed under Free Crochet Patterns. You can follow any responses to this entry through the RSS 2.0 feed. You can skip to the end and leave a response. Pinging is currently not allowed. On your coffee cup sleeve, what size crochet hook?